I have tried a few of these so called "Dock Programs", but none of them I have really liked. For example, on TechTV's "The Screen Savers", I heard about a program called Moby Dock. Unfortunately, it crashed about every second. However, hope is not lost! After searching the new programs that just came out, I came across this program called Aqua Dock, and it is great! So far it has not crashed, and has been very stable. It is a "dock" that will sit somewhere on your screen, allowing you to click one of it's icons to launch a program. Additionally, when you put your mouse over the dock, it gets bigger, and looks just like the Mac OS dock. Other than the shortcuts to programs that are already on it, you can add your own shortcuts to it by simple dragging and dropping icons onto the dock. If you think about it, Aqua Dock is just like your Quick Launch toolbar, but cooler. But what about the features?! The one big feature that makes this program even better is the auto-hide. When you have it set to auto-hide, it will "go away" when you move your mouse away from it, but when you move your mouse to the spot where it use to be (before it "went away"), it will "come back". As for the point of this feature, it will allow you to have less clutter on your screen. Another neat feature is that you can have it on any side of your screen, from the top or bottom to the left or right sides. This, unfortunately has a few flaws. First of all, if you have it set to be at the bottom of your screen, it will sometimes get in the way of your taskbar. Additionally, if you have it set to be on the right side of your screen, it is going to come up whenever you try to scroll up or down a page. I would recommend to set it for the left side of your screen, since it will not interfere with anything there. Other than the stuff I said before this, this program seems to "get mad at you" if you try to drag a program with an invalid icon into itself. For example, I was having some problems with MSN Messenger, and once I got it fixed the icon for the program must have gotten corrupted. 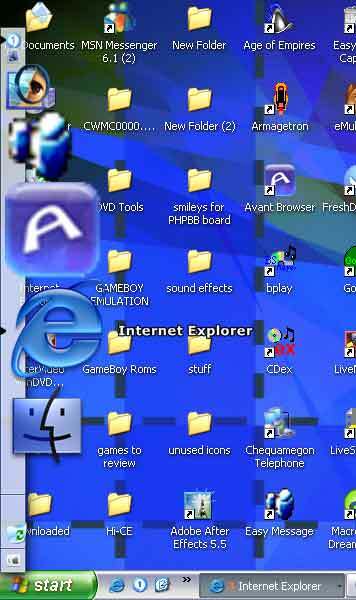 And when I dragged that icon into Aqua Dock, I got a very annoying error every time Aqua Dock started saying it can't find the icon for MSN messenger. I fixed this easily by just hacking the data file for Aqua Dock, but a lot of people may have no clue on how to do this. However, don't worry about it, the odds of it happening are slim and if it does happen, just reinstall the program (remembering not to ever put that icon that messed it up into Aqua Dock again). In conclusion, for anyone who wants to "WOW" there friends with a fancy menu on there desktop, or wants a convenient way of running their programs, Aqua Dock is for you! EXTRA NOTE: It says it supports certain plug-ins, but I have not gotten them to work yet, so until I do, I won't say anymore about them in this review.